Welcome to WAHO LIVE! 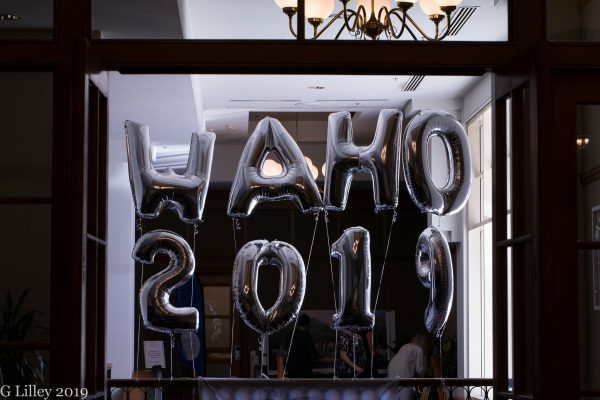 The full day by day report from Australia as the 2019 WAHO Conference takes place. Kia Ora from New Zealand! My final update to WAHO LIVE! and I am sat writing this from our utterly enchanting B&B in Bombay. It is called Heaven’s Rest and I thoroughly recommend it. The reason for my writing from ‘home’ is two-fold. Firstly, I wanted to devote some time to a decent final update, capturing the very best of the last few days. And secondly, I have finally succumbed to the cold that has slowly made its way through all the delegates. It seems I am the last to have it, so opting for more sleep, lots of r&r and water, and a day with scenic views today while catching up with work seemed like the perfect option. So, back to the penguins! Oh my, they were as adorable as I hoped the would be! We had a guided ranger tour and Louise, the guide for the group I was in, was extremely knowledgeable. Among the many fascinating facts that we learned were that while the average age of a penguin could be as low as seven/eight years, many have lived to later years. The older penguins at Phillip Island were tagged rather than micro-chipped, and indeed we would see such a penguin later; he/she was at least 18 years old. And I say he/she as it is very difficult to tell male and female penguins apart – the male beak is marginally longer and hookier, and that is the only difference! While we were not allowed to take photos once the penguins began to come in from the ocean, I did get this – not terribly good – snap of a baby penguin waiting for his parents to return from their fishing trip. 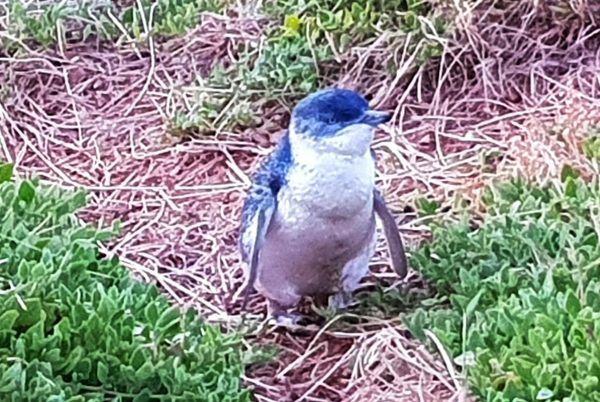 Baby penguin on Phillip Island. Credit The Arabian Magazine. To see the penguins coming to shore was just lovely, and they definitely felt that there was safety in numbers! We then moved further inland to watch them heading up the walkway and going to their nests for the night; it was particularly touching to watch a Mr and Mrs Penguin reunite after three days out fishing – yes, three days. 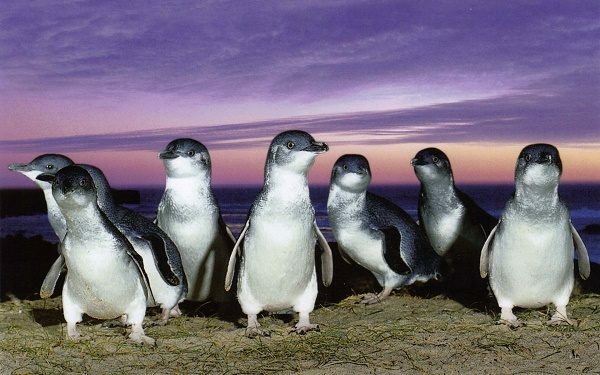 Man has over-fished near to the coastline, so these little penguins, which are no more than a foot tall, now have to swim much further to find the fish that they need to survive. That, along with the dreaded plastics, is their biggest threat right now. We all need to change our attitudes to single-use plastics, and fast! After a night in a coastal camping site – we were in permanent accommodation – we headed off to South Serenity Arabians some three hours drive north. Belinda and Peter O’Connor had opened up their beautiful facility to us, and hosted an utterly delicious champagne afternoon tea for us all to enjoy while watching a selection of horses belonging to both them and their friends. I will share a report from this presentation in a later edition of The Arabian Breeders’ Magazine, but there are two stallions I must include now. 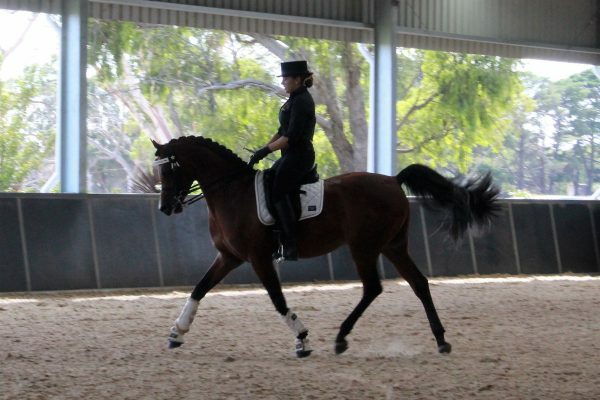 The first of these is Belinda and Peter’s own super-star stallion, Mystic Abbas. I know he has already been included in this coverage, but this really is a stunning Arabian stallion and he is exceptional under saddle. 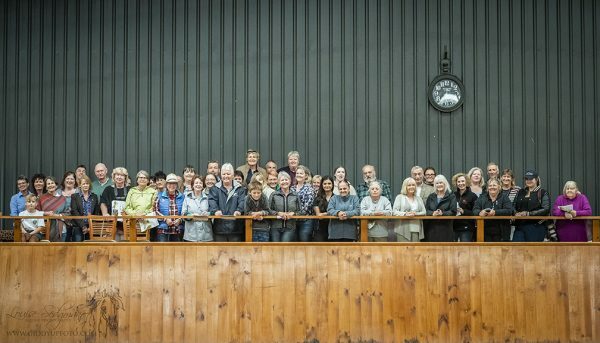 Not only that, his foals – some of whom we saw at this open house – are proving the O’Connor’s faith in him not only as a show horse but as a sire. Mystic Abbas presentation at South Serenity Arabians. Credit The Arabian Magazine. The presentation closed with something very special indeed, as the delegates were honoured with a display by Gai el Jullyen (Jullyen el Jamaal x Gai Fantasha). This 19-year old stallion was as captivating as ever, and I was somewhat emotional when it was announced that this was his final public appearance. I think that we all felt not only honoured to see him, but humbled that we were there to see his farewell from the public eye. Thank you. Gai el Jullyen. Credit The Arabian Magazine. From there, we went to Krishlah Arabians, owned by Olivia Cleary with her parents, Sharon and Max Warke and sister Shona Young. Again, the terrific Victorian hospitality greeted us and after some fantastic home cooking, we went outside to see some of the famed Kirshlah horses, with this breeding programme being a true multi-generation family affair. Of particular note for me was their young colt Volt KA, sired by their own stallion Victorious KA (Vitorio TO (US) x Breathless) and out of their mare, A’Real Diva KA (SF Sir Real (US) x Adiva). Olivia explained that this is the first time they have kept a stallion as they have such a strict gelding policy, adding that Victorious KA has crossed very well with their mares. Volt KA was, for me, the next step in this line, and it will be interesting to see how he matures over the coming months – and if he gets through their gelding policy! Volt KA. Credit The Arabian Magazine. The rest of the delegates then either headed home or went to New Zealand on the Thursday, but we opted to stay in Victoria for one more day. I wanted to visit The Enayat Partnership – that of Megan Borowiak and her husband Paul, with Peita Brown. 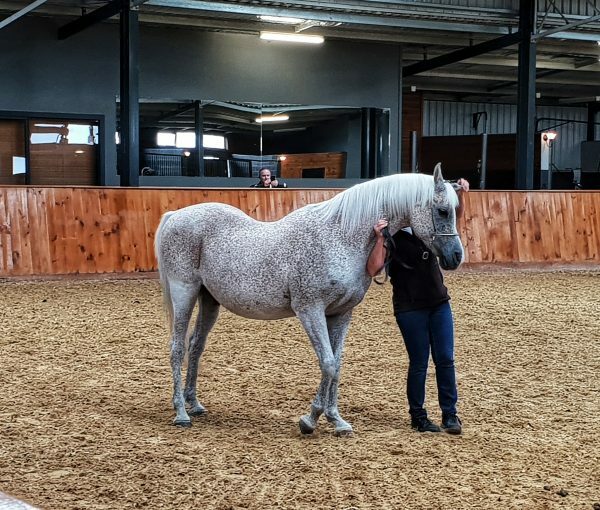 They have long been supporters of The Arabian Breeders’ Magazine, and while they both have backgrounds rich with horses, this is a relatively new partnership, bringing Megan back to the world of the Arabian horse for the first time in around 20 years. It was lovely to see the ‘EP’ breeding programme, through their young foals and promising youngsters. Their focus is straight Egyptians, and they certainly have some interesting horses to build great foundations on over the coming years. But again, it was an old boy who tugged my heart: this time, The Source CC (Salaa el Dine x Mouna). 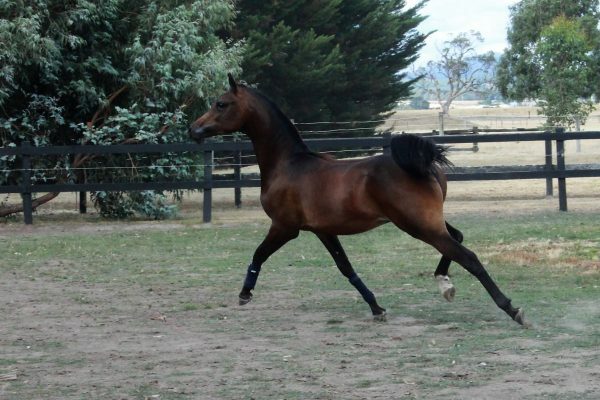 This straight Egyptian stallion was bred in the US and imported first to New Zealand and then Australia. Now 20 years of age, he looked amazing and it was wonderful to spend time with this gentle yet charismatic old boy. They don’t make them like they used to! The Source CC. Credit The Arabian Magazine. We also saw a couple of other stallions belonging to friends; more of them later! We raced back to Melbourne, however, as we have an evening appointment planned with a dear friend we had not seen in years. The evening was spent with Sean Johnson and his wife, Carolina, talking about Crabbet Arabians and what an important place they still have in the world today. Friday, we headed to Auckland and – joy of joys – to an apartment where I could cook! While I have been out here in Australia, news has broken back in the UK that I am a contestant on MasterChef 2019, so it has been a fun week keeping up with messages as well as being even more frustrated that I didn’t have a kitchen to cook in! 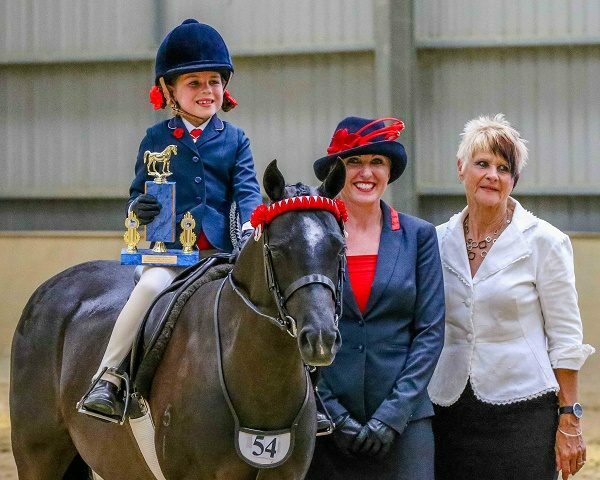 Saturday and today is all about the New Zealand Arabian Horse National Championships, and it was a treat to see double Australian National Champion Chelleason Crown Jewel (Gai el Jullyen x Sophia WV) take the New Zealand Stallion title. Having seen his sire earlier in the week, this piece of symmetry underlined what a truly great trip we have had. Chelleason Crown Jewel. Credit The Arabian Magazine. Yesterday’s show day ended with so fun classes, including the costume class. The two below particularly caught my eye. The evening ended with a fun-filled gala dinner where the WAHO delegates were thanked for making the journey down to New Zealand. The WAHO organiser present, Scott Benjamin, also said that he hoped that this weekend would mark a start of closer ties between Australia and New Zealand. Finally, the New Zealand Chair Adele Maraki thanked WAHO for visiting, and hoped that we would all enjoy the last day of the show. So there we have it! In a few hours, WAHO 2019 Australia will be done, and all eyes will be looking ahead to Jordan in 2021. I truly hope that you will visit the WAHO website and sign up this fabulous organisation. If you do, then there is a high chance that I will see you there in Jordan in two years time, enjoying all that the WAHO family has to offer, and how it truly puts the Arabian horse first in all that it does. Thank you so much to everyone who has made us so very welcome the last few weeks, especially Scott and the whole WAHO team (I don’t want to list names for fear of leaving anyone out in my cold-riddled state!). This truly has been the trip of a lifetime, and we still have one more week to enjoy here in New Zealand. So there may well be a post-post conference update, as we take in Maoris, hobbits, a Crabbet breeding programme, and New Zealand’s oldest straight Egyptian breeding programme. Thank you all for reading. WAHO delegates and Victorian Arabian horse breeders at Gippsland. Credit Louise Sedgman. I apologise for my lack of coverage the past few days. The days have been very busy and wifi has not always been available to do updates. Add in some early mornings, plane rides, long days on buses and I hope you will forgive me! The Gala on the last night of WAHO was amazing, and it really celebrated the event. Over $5,000 was raised, and everyone enjoyed a great evening of good food, good company and good dancing. More of this will come later in my full conference reports, which will appear in print in The Arabian Breeders’ Magazine. Alabama was undoubtedly the highlight of the weekend, and we enjoyed a very relaxed meet and greet with the chief sires of Mulawa, and for me seeing Allegiance MI (Magnum Forty Four x Audacia) was very special indeed. 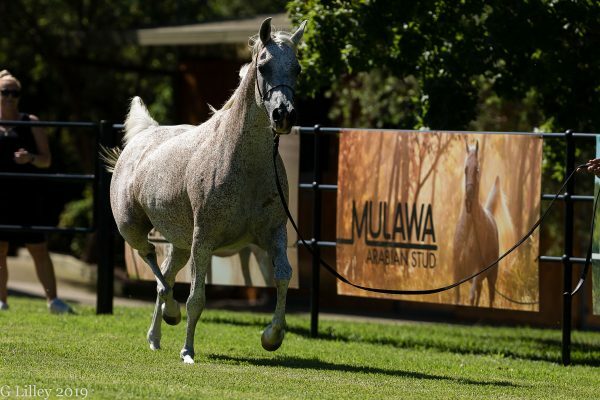 This young stallion truly is the up-coming sire of note for Mulawa, and we ran a full feature on him in our December edition of The Arabian Breeders’ Magazine. He met all my expectations and more, and it truly was wonderful to see him. Allegiance MI. Credit The Arabian Magazine. Another highlight was Sunday afternoon, when we stopped at the Hollydene Estate Winery. Beautiful wines, nice food, and a chance for one last photo together with this particular set of delegates. The Hunter Valley Tour Group. Credit The Arabian Magazine. One last night in Sydney called – spent sitting in the bar and saying farewell to friends we will not see again for another two years. One last drive past the Sydney Harbour Bridge… Credit The Arabian Magazine. Monday – which I believe was yesterday! – saw an early start as the group separated. Some went home, others flew to Queensland for the post-conference tour there, while we headed down to Victoria for this group of post-conference tours. There are 10 of us in total here, covering five countries – Austria, Australia, Germany, the UK and the USA. Monday was spent as we wished, and then today was the first day of a two-day tour. 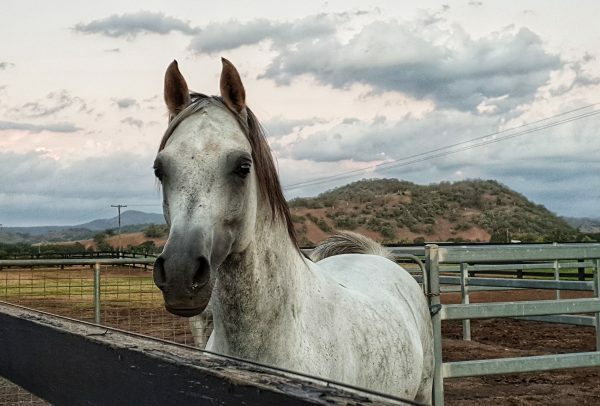 We headed to Ripplebrook, where a small group of Victorian Arabian horse breeders put on a beautiful presentation for us, including Arabian ponies and purebreds; I think that half the group now want to start breeding Arabian ponies! 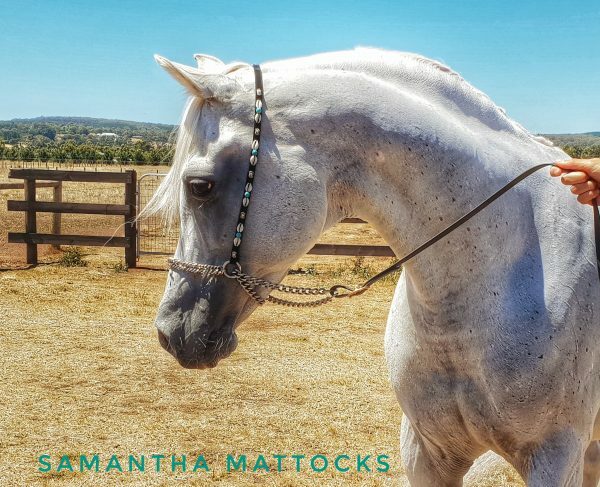 The highlight for many, however, was the 25-year old purebred gelding, Kathmar Park Maverick (Mash x Zareefa) – whose damline coincidentally goes back to my own mother’s first part-bred Arabian; even when you are in Australia, it is a small world indeed. Kathmar Park Maverick. Credit The Arabian Magazine. It really was a lovely presentation, and a huge thank you to everyone for all their hard work in bringing the horses for us to enjoy. Thank you, too, to Katherine for the wonderful lunch and to Cannibal Creek Vineyard for providing the wines that accompanied lunch. All too soon, it was time to head off to the next stop. This is Phillip Island, where in a few minutes, we will be off to see the Penguin Parade. I know that I am not the only one who can’t wait for this! We are not able to take photographs, in case a flash goes off and scares the penguins, but there is a download link we are able to do so we can share these amazing little creatures forever. In many ways, it will be lovely to be present and just enjoy seeing the penguins, rather than worrying about taking a perfect photograph! Tomorrow, we have two stud visits. 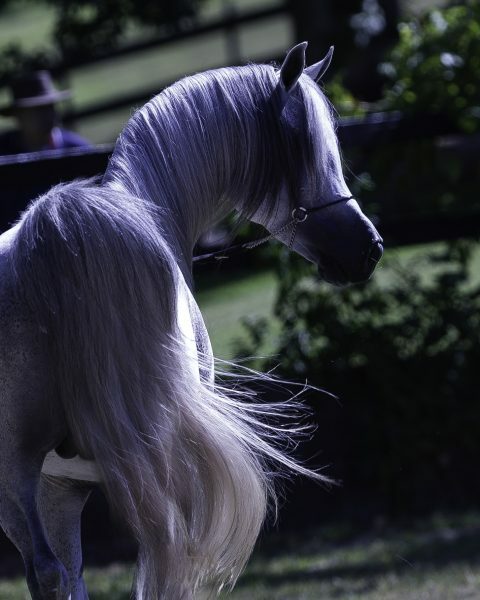 The first is South Serenity Arabians in the morning, and then Krishlah Arabians in the afternoon. From there, it is back to Melbourne and many of the group either head home or on to New Zealand. We are staying an extra day in Melbourne to visit other breeders and to see friends, and then it is off to New Zealand we go. There, many of the group will reconvene for the NZ Nationals. As you can see, there still is a lot to enjoy from WAHO 2019 yet! 17.15: Peter Pond declares the 2019 WAHO Australia Conference closed. There is still much more to come through from Australia. Tomorrow, we head to the Hunter Valley and then to Victoria on Monday. The following Friday – this time next week – we will be in New Zealand. The adventure continues! Now, it is time to go and put on our glad rags, and enjoy the gala. 17:00: It is now time for thank yous. There are a lot of people involved in running such an amazing event, and each thank you is well deserved. 16.55: HRH Princess Alia has invited everyone to Jordan and we are now watching a video of just some that this amazing country has to offer. Seriously, if you have enjoyed any part of this report – and there is still so much more to come – and you are reading this thinking ‘I wish I was there…’, now is the time to start planning. Join WAHO, become a member of this organisation that truly has the Arabian horse at its heart, and join us in Jordan in 2021. There is plenty of time to start planning, to start saving, and to align your own life even more with that of the Arabian horse. 16.53: That announcement was meant with huge cheers and applause. I am not surprised, Jordan is the most beautiful country You all need to start planning now – 2021, Jordan! Inshallah, we will all be there. 16.52: THE NEXT WAHO CONFERENCE IS IN JORDAN!!!! 16.50: Peter Pond is now outlining the plans for the next two years, which include working to get younger members into WAHO as well as continuing the search for an official home for WAHO in the UK. 16.45: As I mentioned, there is an art auction tonight and I know I am not alone in having this one as my favourite. The Desert Spirit by Emad El Taay, born in Baghdad and now living in the UK. I will share how much it goes for later. 16.20: Cindy’s talk concluded with weaning which, as she said, used to be a bad day for everyone! She advocates buddy weaning, granny mares, and pasture weaning – where the mare is taken out of the paddock, leaving behind the foal with other mares and foals. The foal may be upset for five minutes or so, but because in the herd environment and no one else is upset, the quickly realise that there is no need for them to be upset either. Cindy Reich is one of the modern industry greats, and everyone very much enjoyed her talk. There is now a quick break and then the WAHO Conference for 2019 will be all but over. And of course, the burning question on everyone’s lips is – where will the next Conference be held? 3 – the mare to pass the placenta within three hours, ensuring that the non-pregnant horn has also been passed. Most dramatically, Cindy shared about the Madigan Foal Squeeze in dummy foals. This squeeze replicates birth and ensures that the right signals are sent to the brain. A dramatic video showed a three-day old dummy foal suckling within five-to-ten minutes of the Madigan Foal Squeeze. To say this is amazing is an understatement! I thoroughly suggest that you research this now. 15:00: I have finally caught up and am on today! There was more WAHO business to discuss, including concerns around cloning and – even more alarming – gene doping, and then the focus was on the guest speakers. Some of the 2019 WAHO delegates. Credit Foxwood Photography. Dr Madeleine Campbell from The Royal Veterinary College in the UK sent a video talk on Welfare and Ethics in Horse Breeding and Horse Sports. This was riveting, and the underlining message was just because you can, doesn’t mean you should. She also praised WAHO and Arabian breeders for not being afraid to talk about difficult issues, adding that this makes us rare among other breed societies. Professor Chris Whitton from the University of Melbourne presented two fascinating talks on Causes and Prevention of Injuries in Race and Endurance Horses. I think the biggest surprise here was that those horses who are started younger are less likely to suffer devastating bone injuries. He summaries by saying that ways to prevent injury include: limit accumulation of fatigue – reduce cycles of load (distance) and reduce load (speed); adapt bone to speed and surface; maximise bone repair – reduce training intensity and regular rest periods; minimise use of medication to keep horses in training. There were plenty of questions following Chris’ talks, and this is certainly a hot topic given the continued loss of life in endurance horses, particularly within the UAE. Julie Fiedler from the University of Central Queensland is set to present on When Social Media Gallops Ahead – Sport Horse Welfare and Social Licence to Operate, while Cindy Reich, from California Polytechnic University in the USA, will end the day with It All Begins with a Foal: Practical new techniques in foaling practices and foal care, from birth to weaning. 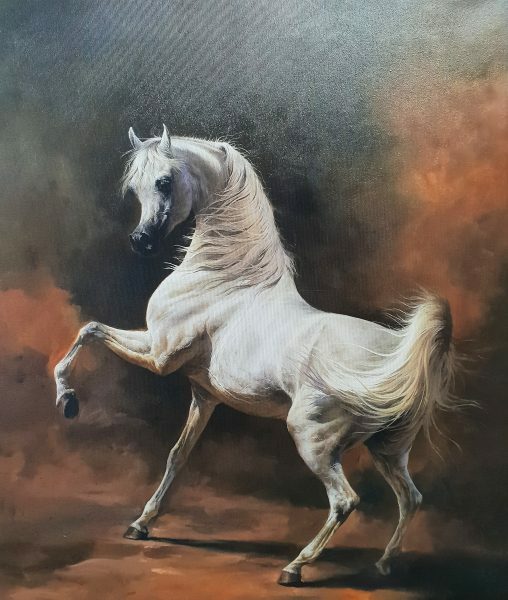 Some of the Arabian art on offer here to purchase. Credit Foxwood Photography. 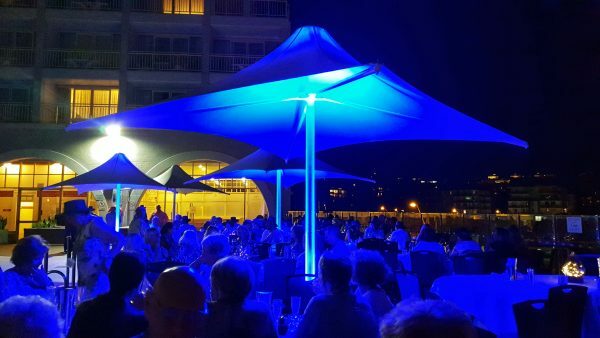 The Conference will end with an announcement of where the 2021 WAHO Conference will be, and then tonight it is the gala dinner. This includes an art auction, and there are some breath-taking pieces on offer. Tomorrow morning – rather early – we head to the Hunter Valley for the first of the post-conference tours. The adventure is set to continue! Simeon Stud started proceedings, with over 100 people gathered together to enjoy the hospitality of Marion Richmond. 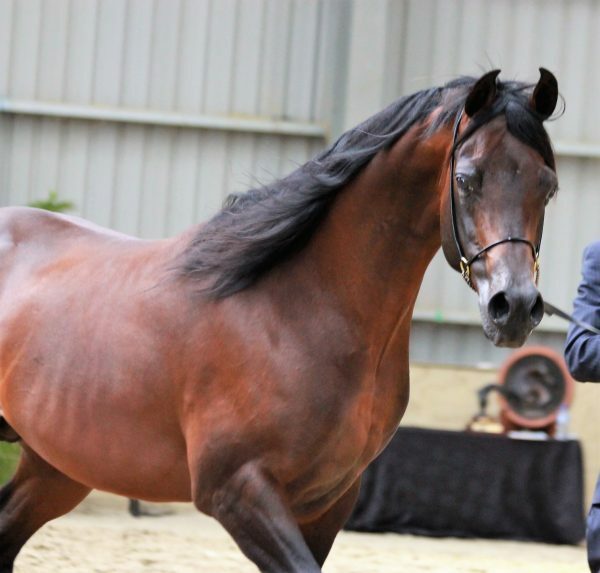 Simeon Stud has been breeding Arabians for over 60 years, and progressed from Crabbet lines to focus on straight Egyptian. Simeon-prefixed horses are found the world over, and they have taken titles on almost every continent. 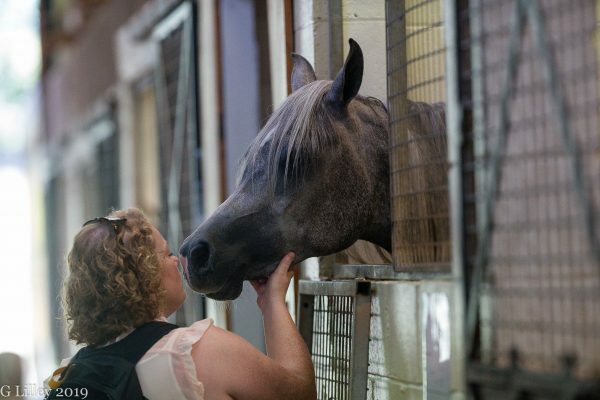 One of the delegates gets up close to a mare at Simeon Stud. Credit Foxwood Photography. Visitors had a presentation of just under 20 horses, with many more available to view the glorious paddocks around the farm. From the newborn foals, to older mares as well as some of the stallions Simeon is so famed for, it was a wonderful celebration of the farm’s breeding programme. Straight Egyptian beauty at Simeon Stud. Credit Foxwood Photography. Having topped up on vitamin D, it was time to go around the corner to Mulawa Arabians. Founded by Greg, Julie and Jane Farrell – who were all in Scottsdale to watch their latest homebreds compete – the day was hosted by Scott Benjamin and the Mulawa staff, as well as Katherine Farrell, their brilliant rider daughter who opened the day with a dressage display. 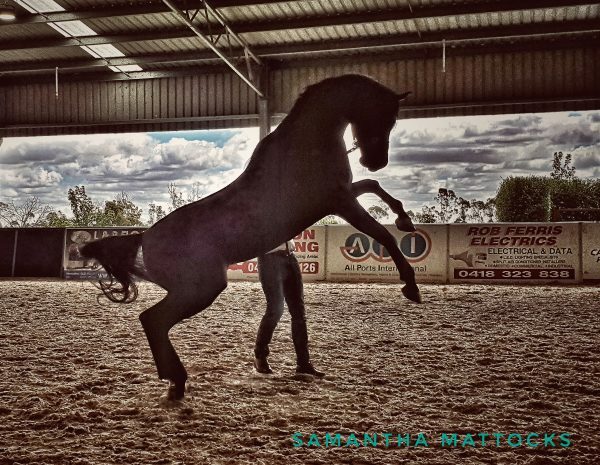 A Chance to Dance (Magnum Forty Four x Mulawa Chance) opened the presentation at Mulawa Arabians. Credit Foxwood Photography. Also founded on Crabbet lines, Mulawa is built on Polish influences and a brief display of 14 Arabians of very different types – but with a collective look – followed. Many of their horses are at their Alabama location in the Hunter Valley, which we will be visiting this weekend, and the presentation was moving and barely touched the surface of this impressive breeding programme; Mulawa, too, have bred Arabian horses who have shone in the United States, Europe and the Middle East. Mulawa Kara Mia Mi (GLF Apollo x Karmaa) is the 2019 WAHO Trophy Winner. Credit Foxwood Photography. All too soon, and with many of the delegates being a little sun-weary, it was time to head back to Terrigal. I think everyone headed to their bathrooms for a quick shower to cool off before heading for an early night. This WAHO Conference is certainly proving to be a busy – but brilliant – one! 11.20: Wednesday saw the conference proper begin, and Leonie Williamson, Chair of the Arabian Horse Society of Australia (AHSA), opened the event, saying what an honour and privilege it was for the AHSA to be hosting the WAHO Conference here in Australia – a country that has been host to this amazing event three times in 35 years. Welcome to WAHO 2019! Credit Foxwood Photography. 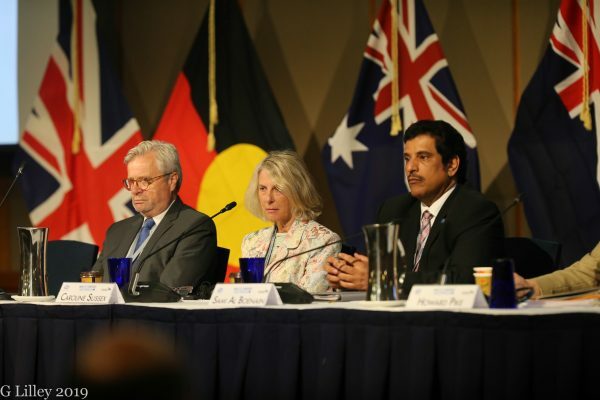 The opening to the conference was a brilliant talk entitled From the Desert to the Lands Down Under – A brief canter through two centuries of Arabian horse breeding in Australia and New Zealand. Coralie Gordon had the unenviable job of covering how the Arabian horse arrived into Australia and developed from there. She managed to cover a huge, huge history into a concise talk, going back to the 1800s and thoroughly covering how the breed has evolved. Allan Preston then followed, covering The Arabian Derivative in Australia, Etched into History. Again, this was a fascinating, in particular the way in which the AHSA has incorporated so many Arabian-related horses into their registry, thus boosting the number of active members; Allan noted that many of these owners go on to purchase a purebred Arabian, something that can only be a good thing. David Gillett then finished with a predominately pictorial look at the modern bloodlines in Australia, and also a look at the Leading Contemporary Sires, which was particularly interesting. Peter Pond, WAHO Chair, opens the 2019 Conference. Credit Foxwood Photography. 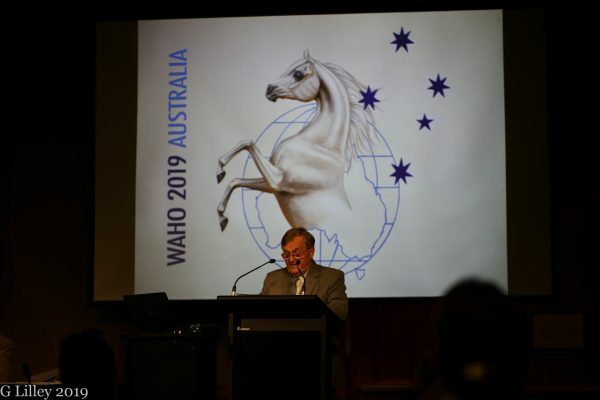 “Welcome everyone to the 2019 WAHO Conference in Australia,” said Peter Pond, Chair of WAHO, as he officially opened the conference. 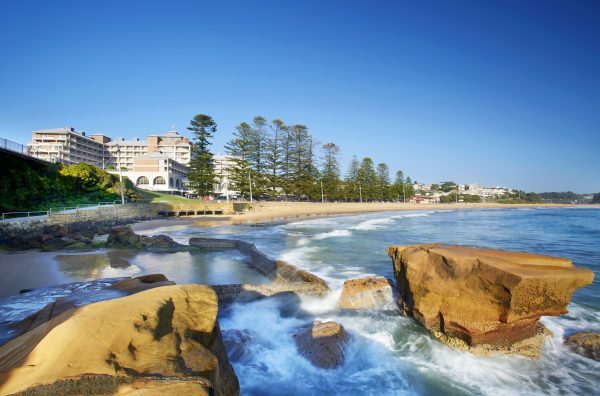 “We chose to have the conference in beautiful Terrigal. Enjoy the surroundings, we thought that it was a great destination as it is relaxed and intimate. “It is hard to believe that the first conference here was almost 20 years ago. There is a saying that ‘everywhere is far away from somewhere’ and here in Australia especially, that is very true. A sincere thank you to all who found it within themselves to make the effort, both physically and economically, to be here. It is clear that the room is full of dedicated Arabian horse people. Executive Committee Members Marek Trela, Caroline Sussex and Sami Al Boenain. Credit Foxwood Photography. A large part of the first day of the conference is the receiving of reports from the voting delegates regarding Arabian horse affairs in their countries. 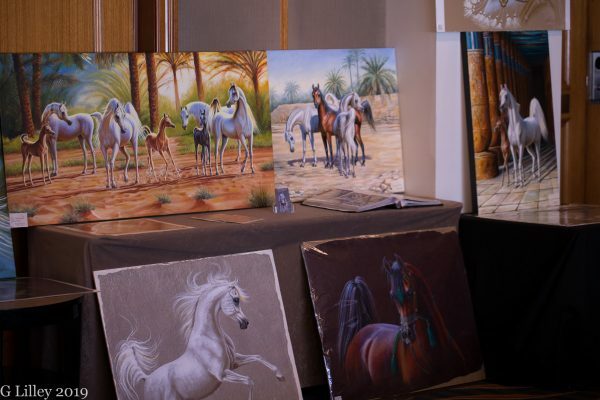 Syria, who moved all attendees so much last time, were not able to attend due to visa issues, but a report was read that clearly shows just how much the Arabian breed is beginning to grow again in this war-torn country. Also of note, for me, was Libya who explained that they are presenting the WAHO Trophy to all those horses who lost their lives in the troubles this country encountered. It is clear that the horse is still a victim of war, but that there are still caretakers who continue to hold the breed dear and will do all they can to honour it. The day finished with a ‘market street’ dinner in the hotel, which again gave delegates a chance to interact. 9.40: I apologise for a delay in updates here from Down Under. We have enjoyed two great days, but they have been very full and busy. That, coupled with the heat, has meant that rest has been more of a focus than usual. Back to the opening night, and it really was a great evening. There was a buzz in the air as delegates from around the world reunited. This group is often referred to as the WAHO Family, and it is true – there truly is a family feel to these bi-annual events. The first night, when everyone meets up again, is always special. In true Aussie style, the welcome evening was held by the pool, and the Australian Reptile Park was there with a variety of animals for guests to get up close and personal with. 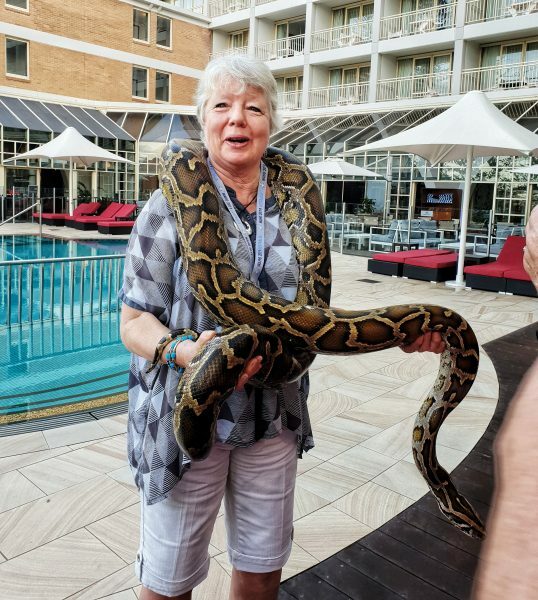 The Chair of the UK Arab Horse Society, Joanne Lowe, was particularly brave, spending a good minute with this Australian python around her neck. Well done Joanne! It was as much as I could do to take the photo, never mind get that close to it! The UK Arab Horse Society Chair, Joanne Lowe, with a python! Credit The Arabian Magazine. 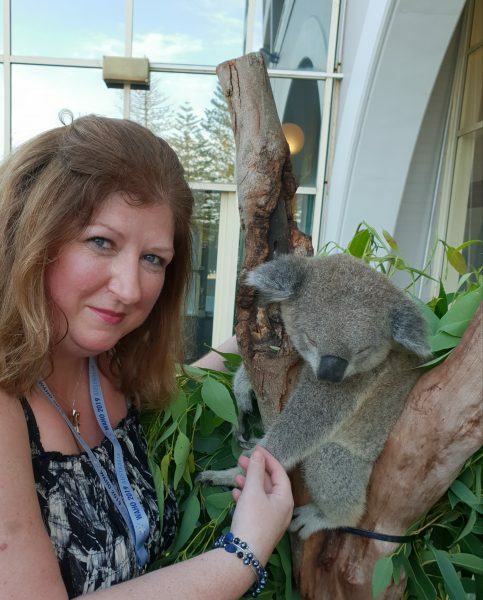 I did, however, enjoy meeting Gizmo, an enchanting koala bear. 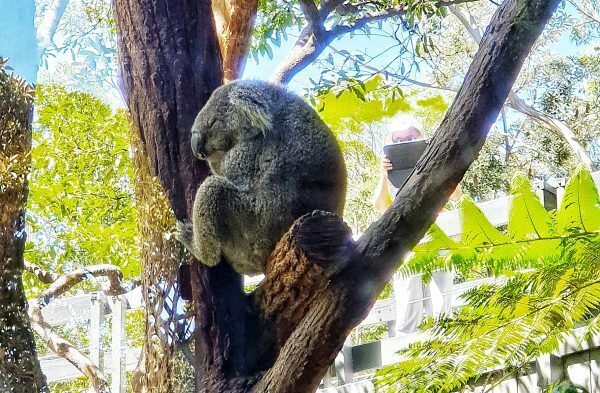 I think for many overseas, koalas sum up the cute side of Australian wildlife, and like all bears, they continue to fascinate. Gizmo was particularly cute, and it was interesting to learn how koala bears sleep for 23.5 hours a day due to their slow metabolism. The respect that all these animals were shown with that opening night also underlined just how important it is that we preserve wildlife and nature as much as we can. The author, Samantha, with Gizmo the koala bear. Credit The Australian Reptile Park. Another highlight from the opening night was Carol Heuchan, a brilliant Australian bush poet. She delivered a wide range of poetry from ones that made you laugh to ones that moved your soul. Carol was an amazing addition to the night’s events, and her clever portrayal of the equine world through her words was inspired. The celebrations of the opening night. Credit The Arabian Magazine. It was a brilliant opening to WAHO 2019, and congratulations to the organisers for such a great event! The WAHO Conference is underway, but before I give a full update from last night and this morning, I wanted to share this photo from last Saturday’s East Coast Championships. Mystica Abbas. Credit Foxwood Photography. The East Coast Cup is a wonderful ridden class, with a section each for both purebreds and derivatives. 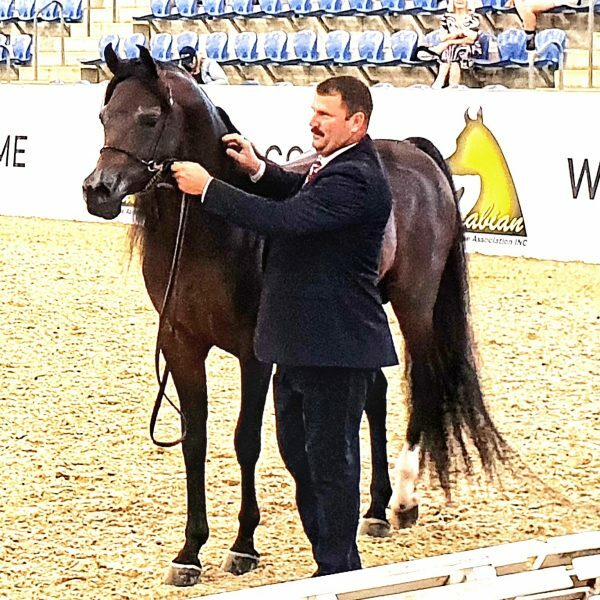 The purebred section was won by the multi-talented seven-year old stallion Mystica Abbas (LC Prince Magnum x Princess of Marwan). Bred by Mystica Arabians, owned by Belinda and Peter O’Connor and capably ridden by Elouise Lando, Mystica Abbas excelled throughout the show, taking Champion in the East Coast Cup, the Ridden Stallion Championship, Champion Bridle Path Hack as well as Reserve in both the Supreme Ridden Championship and the novice dressage. What a horse! Those WAHO delegates visiting Victoria next week will be able to enjoy Mystica Abbas at home as South Serenity Arabians host an open house. Meanwhile, thank you to Glenys for the photograph. Much, much more to follow! 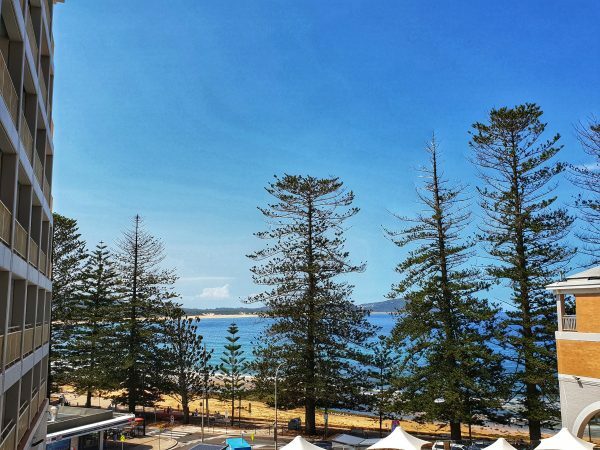 16.50: We are finally here in Terrigal and the setting for this conference is just stunning! More delegates have flown in today, and from my window I can see preparations being made for tonight’s welcome reception. The view from my window. Credit The Arabian Magazine. The best thing about arriving is that we finally have our Conference Packs, with full details in for what we can expect between now and Friday. Tonight, as previously mentioned, is the Welcome Dinner. Tomorrow, we have the WAHO General Assembly, followed by a street market dinner, and then Thursday are visits to Simeon Stud and Mulawa Arabian Stud. For many, I think that these visits will be the highlights of the whole conference, not least as farm visits are becoming alarmingly thin on the ground right now! Friday concludes the WAHO General Assembly and that is the day when we have the guest speakers, who are covering a variety of topics. Friday evening sees the gala dinner, which includes an art auction. There are several Australian horse artists who I truly admire – Tara Brown, Jill Vanstone, and Marian Duncan being top of the list – and that evening should be a great finale to conference week. I think I now need to leave the cool of my room and head outside to join the other delegates and mark the opening of this prestigious event. 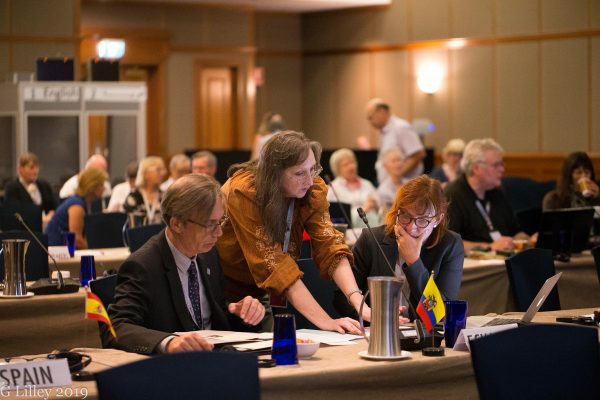 A WAHO Conference is truly an event like no other, and if you missed out on the era of the famed tours to Russia, Poland, America and so in in the 1980s and early 1990s, then perhaps you should sign up to WAHO today. Every two years, you get to visit a different part of the world and celebrate the Arabian horse with like-minded people. You can join at the WAHO website, and that is something that I really would recommend doing. 11.35am: All the remaining delegates are currently gathered in the lobby, enjoying coffee and free, very refreshing lemonade. I have to say, this is a fantastic hotel and well worth looking up if you are ever in Sydney. The restaurant is brilliant – and coming from a foodie, that really is high praise indeed! We all leave at midday to drive up to Terrigal, which is just 90 minutes north. The name derives from the Aboriginal word meaning place of little birds. There, we are staying at the Crowne Plaza, which is the main WAHO Conference venue. The hotel has panoramic views of the Pacific Ocean, and I am very much looking forward to this coastal experience as well as the WAHO Conference itself. 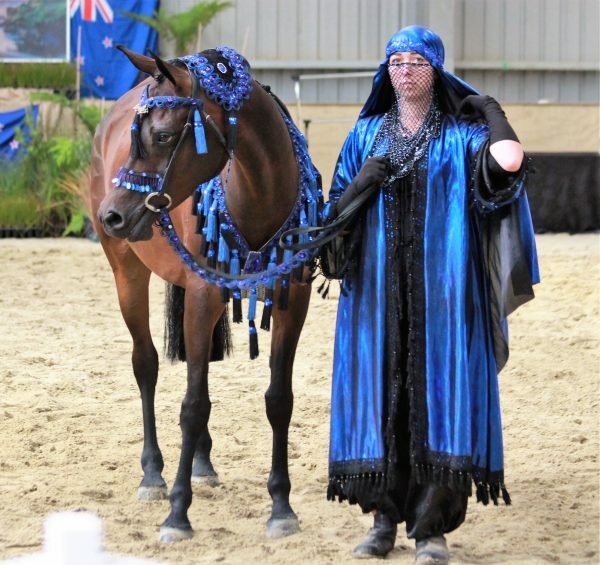 Also present be Carol Heuchan, a local Australian bush poet; she commentated the Arabian Ambassadors Parade on Saturday night, and it was evident that she found the beauty of the Arabian horse both inspiring and moving. It will be wonderful to hear her again tonight, and I think that we are all in for a real treat. For now, however, there is just time to enjoy the view of Darling Harbour one more time before we head north. The WAHO adventure for 2019 has barely begun..! 10.40am: Those on the pre-conference tours move from Sydney to Terrigal, which is where the WAHO Conference itself takes place. Located on the Central Coast, we are hopeful that the beach-side location will bring some welcome relief to the humid temperatures we have experienced the last few days. However, before we check out, I wanted to share one more photo from yesterday. 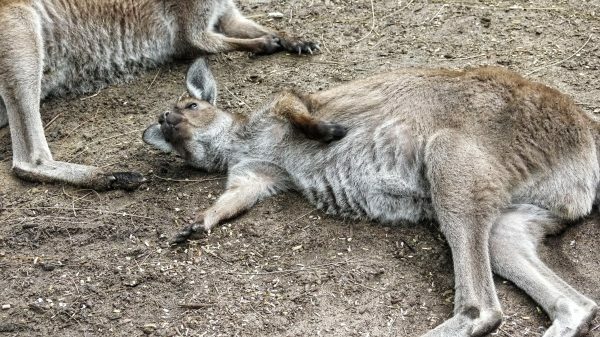 Taken at Featherdale Wildlife Park, it perfectly shows how the animals are the centre of everything, and how relaxed and happy they are. 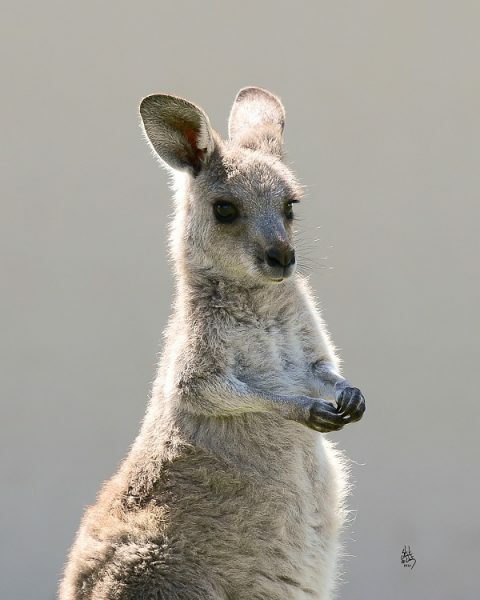 A Joey at Featherdale Wildlife Park. Credit The Arabian Magazine. 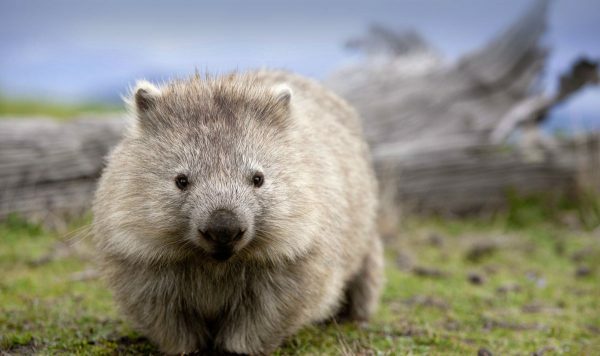 Today was all about the beauty of Australia – its incredible natural beauty, and its amazing indigenous animals. The day began with a stop at Featherdale Wildlife Park, located outside of Sydney. This sanctuary was founded to look after koalas and kangaroos, injured on the country’s roads. 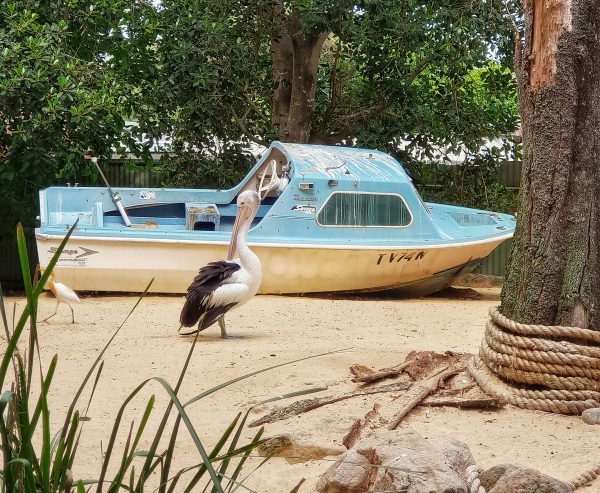 This has slowly grown to be a haven of purely Australian animals, birds and reptiles, and it was a lovely experience to be there and to walk through – and in many cases, pet and feed – these beautiful animals. Each pen had space so that if the animal didn’t want to be around humans, they could retreat to a different place away for them. 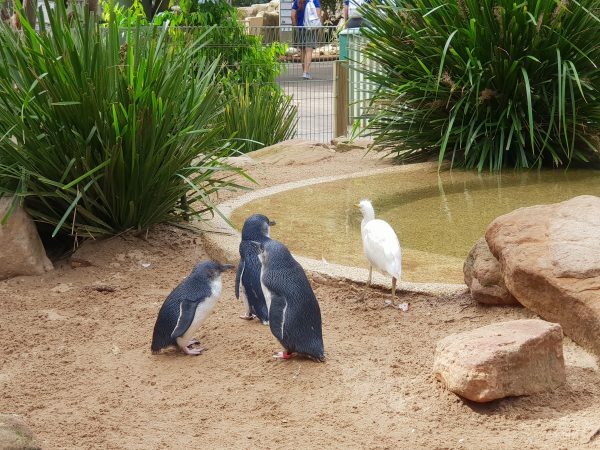 The penguins were a joy to see – I love these amazing creatures! Credit The Arabian Magazine. The whole experience was lovely, and very much focused on the welfare of the animals. There will be more photos to follow, but here is another now of the pelicans in a great setting, complete with a boat and a beach scene! After a quick lunch stop in Leura, it was on to The Blue Mountains. Ever since my first visit to Australia, I have been fascinated by this amazing geological wonder. It is thousands and thousands of years old, and our tour guide, Trys, taught us a lot about the aboriginal history behind many of its features. The most famous of these is the Three Sisters – and the story behind these three rocks, sticking out on the mountain ledge, is amazing. I won’t share it here as there seems to be two versions, but I will endeavour to define it for a later post. We went over the valley with the Three Sisters in a glass-bottomed cable car, and this short video shows just some of the amazing views that we witnessed today. The Three Sisters are on the left of the start of this video. Credit The Arabian Magazine. It really was an incredible experience to be there. I confess, I stopped after this first cable car as I wanted to spend some time alone to just appreciate the beauty of this place. The Blue Mountains really are spectacular, and to be able to be alone there and reflect on the amazing natural beauty of this incredible country – having seen the indigenous animals and then the breathtaking geology – felt very special indeed. 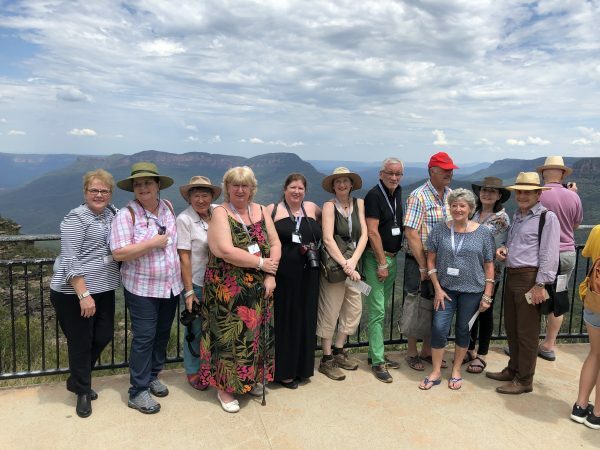 Some of the WAHO Australia 2019 delegates at the viewing point near the Three Sisters. Credit Deb Fuentes. All too soon, it was time to head back to Darling Harbour for our last evening. Tomorrow, we relocate to Terrigal on the Central Coast for a welcome celebration tomorrow night, while the Registrars have already left; they have work to do tomorrow. 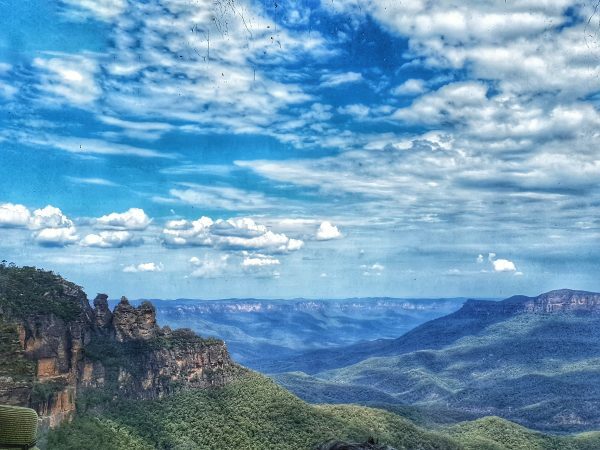 So, to share one final photo with you – this amazing view from the cable car, overlooking The Blue Mountains, The Three Sisters, and an area of truly outstanding natural beauty. The view from the cable car – the Three Sisters are on the left. Credit The Arabian Magazine. 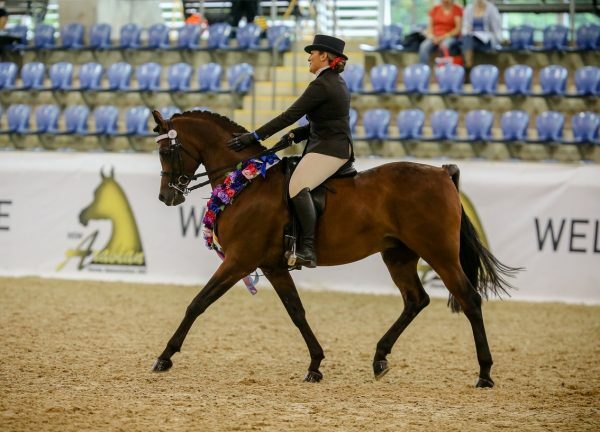 PS – if you missed the East Coast Championships and want to watch the evening, this link will take you to the Australian Equine Network. Enjoy! What a 24 hours or so we have had! The pre-conference tours are proving to be a success, and with yesterday’s Arabian Ambassadors Presentation, and then today’s Sydney Experience, there has definitely been something for everyone to enjoy. To start with the East Coast Championships and the Arabian Ambassadors Parade first, well, what an afternoon/evening! The Arabian Ambassadors Parade was so varied in terms of discipline presented and bloodlines present. I only managed one usable photo, and this was of a stallion I love. This was the gorgeous Renaissance (Chelleason Crown Jewel x Bacchante Evangeline) is a horse I was delighted to finally see in the flesh. Bred and owned by Diane Wright of Bacchante Arabians, he did put on an impromptu liberty display, but this did not stop him from going Intermediate Stallion Champion later that evening. He is such a quality horse, and he truly captivated me. Renaissance. Credit The Arabian Magazine. The evening was also great fun as several delegates got to go into centre ring and present some of the prizes. There will be a full report of the show later, as well as photos from the parade themselves – and not off a phone! 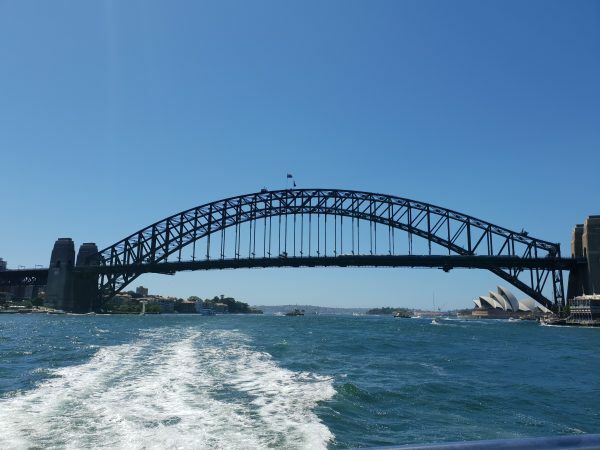 Today, we enjoyed The Sydney Experience, which started with a drive around the Sydney Harbour area before going out to Manly for more photo opportunities. The weather was stunning, for the first time since we have been here, and the conditions made for incredible photographs. 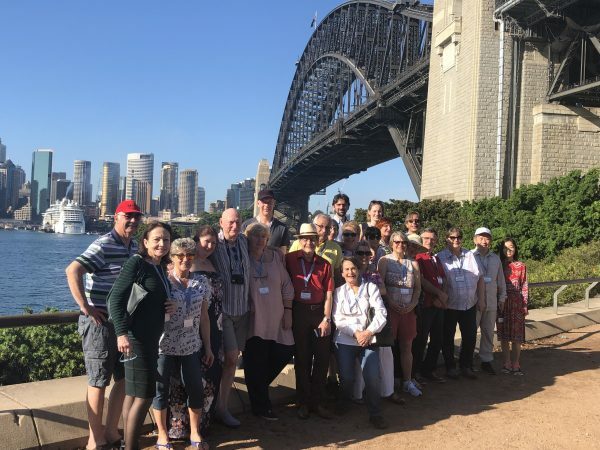 Some of the WAHO 2019 delegates near Sydney Harbour Bridge. Credit Deb Fuentes. 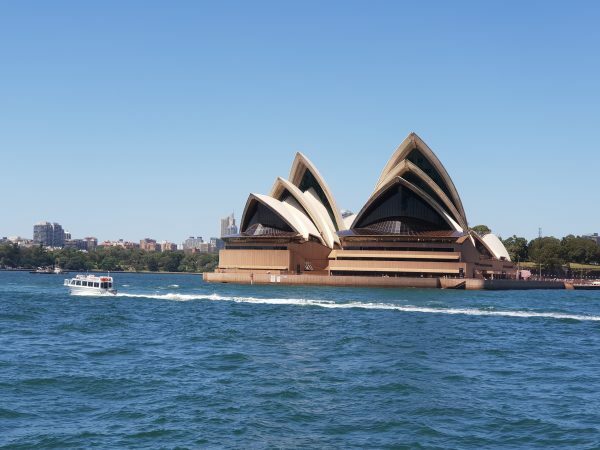 Having completed a wander around Manly, we then got a boat to Darling Harbour, which allowed for great photo opportunities as we went past Sydney Opera House as well as under Sydney Harbour Bridge. 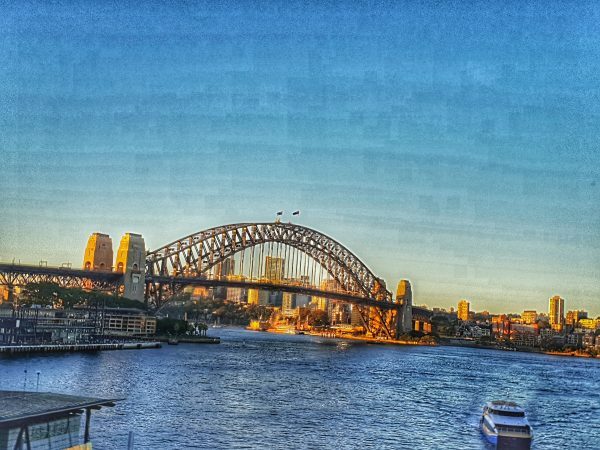 Sydney Harbour Bridge from the water. Credit The Arabian Magazine. Sydney Opera House from the water. Credit The Arabian Magazine. Having arrived at Darling Harbour, it was on to a private charter boat for a lunch cruise around the Harbour. It was a great way to see the area, and we enjoyed the great variety of river-craft – from flying planes taking off and landing around us to one lone fisherman on a kayak amid the giant boats. Quite an experience! Our destination was Taronga Zoo, where we were able to see a variety of indigenous animals as well as other amazing creatures including giraffes, elephants and tigers. A sleeping koala. Credit The Arabian Magazine. Having left the zoo on the last ferry, it was back to Darling Harbour for a stroll across the bridge and back to the hotel. I think everyone headed straight to their rooms for a shower, as it has been a long, hot and humid day. Tonight, a truly international group of guests will be enjoying dinner, before another early night. Tomorrow, the amazing Blue Mountains call. I cannot wait for a chance to enjoy this outstanding area of natural beauty here in New South Wales, and there will hopefully be a full update tomorrow, as well as more photos. I do hope that you are enjoying this view from Australia; WAHO itself is only a couple of days away, and that is where the real fun will begin. I can’t wait. 10.30am: It is another rain day here today in Sydney right now, and there are rumours going around that the Brits brought the bad weather with them; we deny everything! 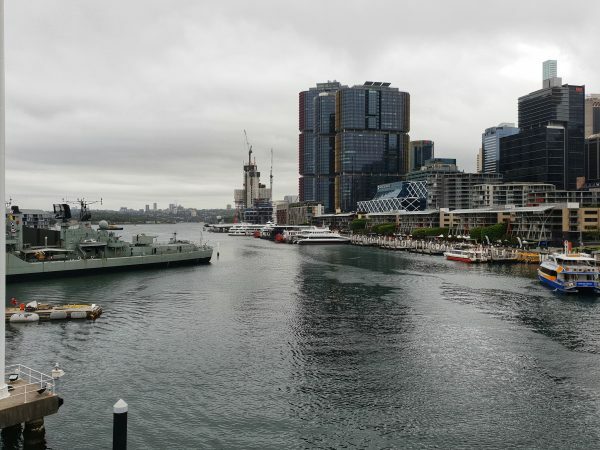 A gloomy day in Darling Harbour. Credit The Arabian Magazine. Today is all about East Coast. 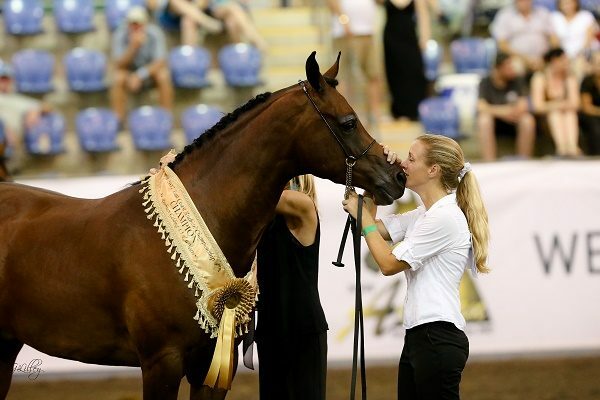 This Championship Show is my favourite in Australia and I am very excited to be returning to the beautiful Sydney Equestrian Centre to see how the breeding programmes in Australia have developed over the past five years, which was when I was last here. The afternoon begins with the Arabian Ambassadors Presentation, a parade of previous WAHO Trophy winners from this amazing country. I know several of the horses who have been awarded this prize, and I know that the parade will be very special indeed. Some of the many great Champions to come from Australia. Credit Sharon Meyers. Following that, there is the East Coast Championships Evening. The judges for this year include Cindy Reich (USA) and Marek Trela (Poland), and they told me last night that they have already selected their champions – and today is the day that everyone finds out who they are. This is a very sensible move on behalf of the NSW Arabian Association, as previous experience has taught me that the Finals Night can continue into the late hours, so to have this part already judged and just the presentations to do will make for a very slick and thrilling evening indeed. Following that, is the welcome dinner. One thing that the Aussies really know how to do well is hospitality (among many great things! ), and I know that all the stops will have been pulled out for tonight. East Coast Finals Night always brings emotion. Credit Glenys Lilley. On a personal level, I am very much looking forward to catching up with friends and breeders from this part of the world who are not on the WAHO tour. The Arabian horse excels at bringing people together, and people I have met here have become great friends over the years. It truly will be special to see them once more, and to share news of all that has taken place since we last met – be it here, in Las Vegas, Paris, Aachen, Dubai, or anywhere in the world. The Arabian horse truly does make the world a smaller place, something that I think is very special indeed. 9am: Good morning from an overcast Sydney! We arrived yesterday morning having left a rather cool Norfolk at 3pm Tuesday. I think several of you know, but it was my birthday yesterday – and still is in England! – and I was met by Scott Benjamin, one of the brilliant conference organisers, at the airport, with him clutching a unicorn balloon and a handful of Cherry Ripes, the ultimate in Aussie chocolate. That is the first thing off my bucket list already for this trip! Several delegates arrived yesterday, including long-time conference attendees Mary Lou Raulerson and Rosemary Doyle from the United States. In fact, it was Mary Lou’s birthday on Monday, so we had a joint birthday celebration last night! Fellow American Cindy Reich is also here, as is Marek Trela from Poland. They are both judging the East Coast Championships today – a day that is, kindly, almost 20 degrees cooler than yesterday so we shouldn’t melt too much! We are located at Darling Harbour for the pre-conference tours, found within walking distance of the iconic Sydney Harbour Bridge and Opera House. For those not at the East Coast, or taking part in today’s pre-conference tour, today is a day of leisure and to explore the city. We are located in Darling Harbour, and there is a wealth of things to do. After such a long flight – 22 hours – I think a gentle day is very much in order. 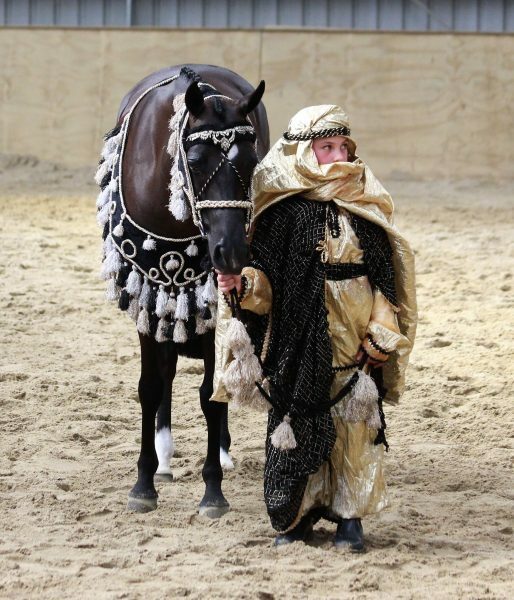 Tomorrow is when the first real event begins – the Australian Arabian Ambassadors Presentation and the East Coast Championships Finals Evening. I have attended the East Coast before, and Finals Night is amazing. Having not been in Australia since 2014, I am very much looking forward to seeing how the breed here has progressed and developed the past five years. I know I will also be delighting in the amazing versatility of the Australian Derivative Arabian, and the ridden championships. A fantastic day is certainly awaiting us! The Australian Arabian Ambassadors Presentation & the East Coast Championships Finals Evening tomorrow night will be an early highlight for the pre-conference tours. 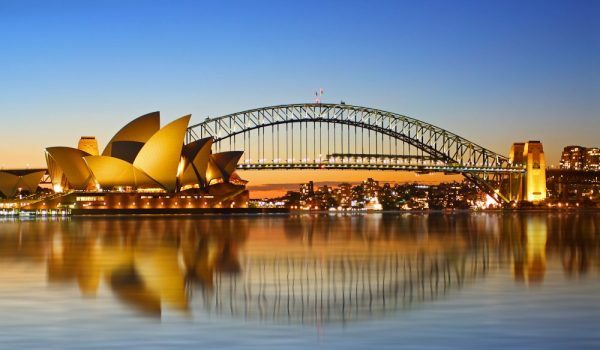 This year’s conference beings in Sydney on Tuesday 5 February but with pre-conference tours to enjoy, including a Parade of WAHO Champions at this Saturday’s East Coast Championship Night, many people are flying in early to make the most of this incredible country. 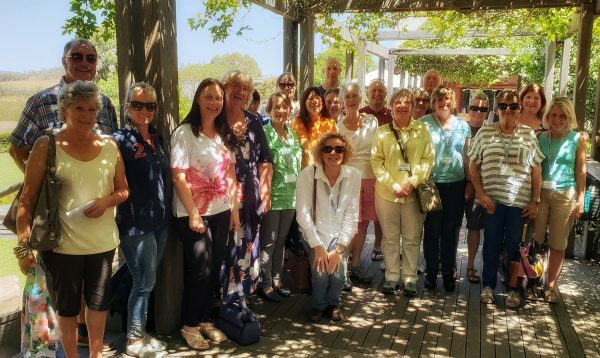 You can read full details of what delegates and visitors can expect from this year’s WAHO 2019 Australia Conference in one of our recent online cover stories, dedicated to this special event. If you would like to know what our WAHO LIVE! coverage will entail, please enjoy this look back at the 2017 WAHO Conference, held in the Kingdom of Bahrain. 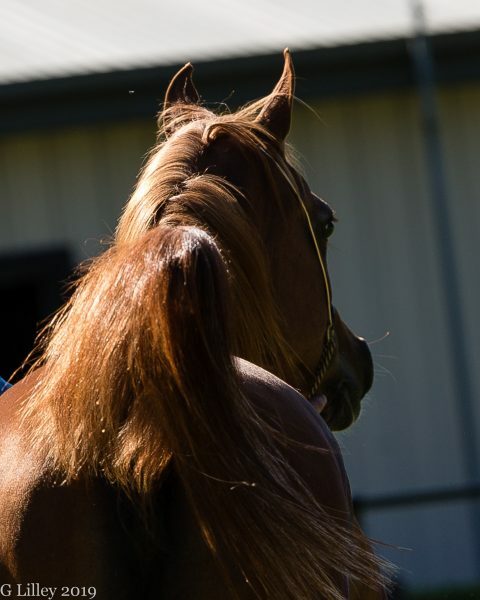 We look forward to bringing you coverage of this year’s WAHO 2019 Australia, and to sharing news, images and video of the beautiful Arabians Down Under with you. Kangaroo in New South Wales. Credit Stuart Vesty. Wonderful reporting Sam! Sure wish I could be there! Have fun and thanks for keeping us updated! You have been amazing to keep up with all that WAHO Australia has had to offer, despite the heat and long days. I thoroughly enjoyed just reading about it, all over again, and I’m looking forward to Jordan WAHO in 2021.